* Promote deep mental & physical relaxation. * Excellent for insomnia & anxiety. Sometimes life can be stressful and full of challenging events, a comforting warm bath soak can be a cure for any disastrous day. A warm bath soak added with Blu Scents Marjoram therapeutic grade pure essential oil helps to soothe & relax an exhausted body and muscles. Not only physically, but also mentally, that peace of mind that many of us need after a long day. This gift set includes with Blu Scents Marjoram therapeutic grade pure essential oil and 3 packets of Himalayan Crystal Salt, nicely wrap & decorated with ribbons, great for self-indulgence or gift giving. The design or colour of wrapping paper and ribbon may vary depending on availability. Blu Scents Marjoram pure essential works great to calm emotions, relieves anxiety and stress. It is also a good muscle relaxant and useful for headache & migraine. Whilst, minerals & nutrients in the Himalayan Crystal Salt works wonder in helping to revitalize one's body and keep skin-nourished. 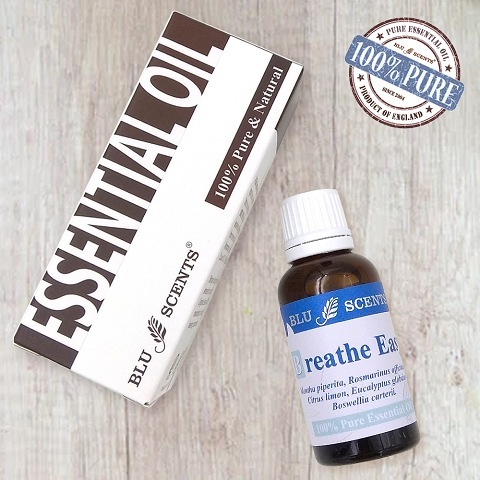 Simply add fews drop of Blu Scents Marjoram pure essential oil and 1 pack of Himalayan Crystal Salt to hot bath, agitate to disperse them evenly, soak for 20 - 30 minutes, breathing in deeply to get yourself relax. Why wait? End your day with a serene note and enjoy a truly blissful bath time with this rewarding beauty rituals. * Eases sinusitis, bronchitis, catarrh, coughs. * Relieve Headaches & migraine. * Good for muscular spasms & stiffness. Blends well with Bergamot, Neroli, Ylang-ylang, etc. Perfectly safe for home use. Do not use it during pregnancy. For massage, it is particulary good for a stiff neck, headache, migraine, aching joints /muscular pain. * Origin from Himalaya, offers all the natural elements original to its source. * Use in bath or soaks to help revitalize your body and keep skin-nourished. For bathing, add 8-10 drops of Blu Scents Marjoram pure essential oil & 1 pack of Himalayan Crystal Salt to the warm bath water when the tub is 80% full. Close the door of the bathroom so the vapours don't escape. Soak for 20 - 30 minutes, breathing in deeply to get yourself relax. For foot bath, add 3 drops of Blu Scents Marjoram pure essential oil & half pack of Himalayan Crystal Salt to a bucket of warm water, soak for 10 - 15 minutes, it is also one of the effective ways in improving your blood circulation.